Those three men and 46 others were massacred on June 12. Another 50 people were wounded. Omar Mateen, who killed them, was armed with a Sig Sauer MCX assault rifle and a Glock 17 9mm semi-automatic pistol. He bought those two weapons legally in the days leading up to the attack. The carnage brought politicians and pundits out in force, using all the usual arguments for and against guns. Because the victims were mostly gay and mostly Latino, and because the attack was carried out by an American citizen with an ethnic last name who may have been enthralled by Islamic terrorism, or a closeted, self-hating homosexual (or both), the commentary quickly became muddled. Was it a hate crime, Islamic terrorism, or a strange double-bonus hit for the haters? Mateen was killed in a shootout with police and so can’t speak to his motives. Investigators were left to sift through the material evidence and a dizzying compilation of online comments, Facebook likes, and recollections from old coworkers, family members, and possible lovers in their search for answers. And all over the country, since that fateful day that elicited the usual cries of “never again,” the killing continues: Alton Sterling and Philando Castille, by the police; Dallas Area Rapid Transit Police Officer Brent Thompson and four Dallas Police officers, Lorne Ahrens, Michael Smith, Michael Krol, and Patrick Zamarripa, by a lone sniper, Micah Johnson, who himself was then killed by an armed police robot; three more police officers in Baton Rouge on July 17. I grew up in a similar family of activists. We, too, were forbidden toy guns and other war toys. My brother and I were more likely to play games like “protester at the Pentagon” than cops and robbers. 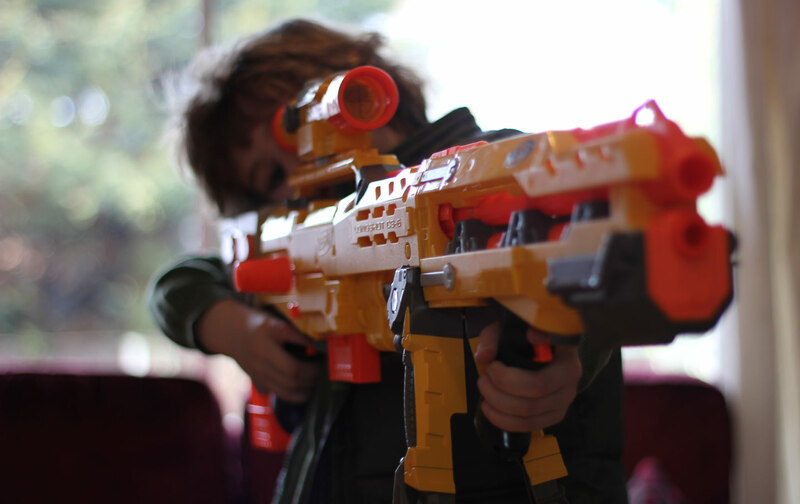 I’ve been thinking recently about why toy guns didn’t have a grip on our imaginations as kids. I suspect it was because we understood—were made to understand—what the big gun of US militarism had done in Hiroshima, Nagasaki, Indochina, and throughout Central America. Our dad had seen the big gun of war up close and personal. His finger—the same one he pointed at us when we were in trouble—had pulled the trigger again and again in France during World War II. He was decorated there, but had zero nostalgia for the experience. He was, in fact, deeply ashamed of the dashing figure he had once cut when home from the front. And so, Dad screwed up a new kind of courage to say no to war and violence, to killing of any kind. His knowledge of war imbued his nonviolent peace activist mission with a genuine, badass, superhero style swagger. Our parents—our community of ragtag, countercultural Catholic peace activists—made that no-violence, no-killing, no-matter-what point again and again. In fact, my early experience of guns was the chilling fear of knowing that, in protest, my father, mother, and their friends were walking into what they called “free-fire zones” on military bases, where well-armed, well-trained soldiers were licensed to kill intruders. So we didn’t point toy guns at each other. We didn’t pow-pow with our fingers or sticks. We crossed those fingers and hoped that the people we loved would be safe. Our inner city Baltimore neighborhood, where crack cocaine madness was just taking hold, drove that point home on a micro level. Our house was robbed at gunpoint more than once—and we had so little worth taking. We watched a man across the street bleed to death after being stabbed repeatedly in a fight over nothing. People from our house ran to help and were there for far too long before an ambulance even arrived. We knew as little kids that violence was no laughing matter, nor child’s play. It was serious business and was to be resisted. What we found was not exactly what I expected—on many levels. I was, of course, looking for the worst of the worst when it came to weaponry, but it proved remarkably hard to find. The aisle did, admittedly, have the Nerf Zombie Strike Doominator and the Nerf Modulus Recon MKIIfor $34.99 each. Those certainly sounded grim, given the eternal war against the undead, but the bright orange, cartoonish, completely unrealistic “blasters” on display and marketed to kids “eight and up” seemed distant indeed from American gun carnage (and our wars in distant lands), nor was there anything on the packaging that even hinted at real people getting shot in real encounters or real wars. I must admit that I don’t like the idea of Seamus shooting anything at anyone—even a brain-hungry zombie—but as it turned out, I needn’t have worried, not this time around anyway. Zombie-killing wasn’t in his wheelhouse. The National Rifle Association (NRA) would undoubtedly have been disappointed by my local Toys “R” Us outlet—just as its officials undoubtedly are by the way most big toy merchants seem to have left their more realistic guns for the online world. This happened, in part, in response to the sort of social pressure that my husband engaged in when in high school and—more critically—the almost routine horror of the blurred line between toy guns and real ones. You know we’re a quirky, gun-crazy nation when Cleveland could ban toy guns and umbrellas with pointy tips from the area around the Republican Convention in the name of security, but couldn’t keep out the real guns in open-carry Ohio. The NRA wants kids to play with realistic toy guns and BB guns, since they believe that such toys are part of a child’s initiation into the future ownership of perfectly real guns. At the moment, the gun lobby is concerned that not enough people have guns—even though the 270 million to 310 million of them already amassed around this country (according to the Pew Research Center) could arm just about every man, woman, transgendered person, and child around. Still, despite the fact that Americans can now carry guns in all 50 states and the NRA continues to win most of the big political fights, the number of households with guns is actually down from its peak in the late 1960s (though those that are armed have more and deadlier weapons than ever before). No wonder the gun industry and the gun lobby are fighting to produce an army of toddlers. “Start Them Young,” a February 2016 report from the Violence Policy Center, details how gun manufacturers and the NRA are eager to market real guns to younger and younger consumers. The report starts with a selection of quotes from the industry, including this gem from Craig Cushman, marketing director for Thompson/Center Arms, about their Hot Shot rifle for kids: “[We’re] talking about a tiny gun intended for the very youngest shooters—the ultimate first gun. We’re targeting the six- to 12-year-old range.” In other words, kids are literally in their sights. We are awash in guns. Where does it end? Gun violence is embedded in our national mythology, our foreign policy, our notions of masculinity, our entertainment industry, and our children’s play. We see violence solving problems on every screen—from the zombie apocalypse to the rise of ISIS. Russian playwright Anton Chekhov’s maxim still applies: “One should not put a loaded rifle onto the stage if no one is thinking of firing it.” Sooner or later, that rifle is sure to go off. It might be an accident; it might be terrorism; it might be hate. But it will go off. Somewhere, as you read this, it’s going off right now. I don’t want to police my kids’ imagination. And there is a whole strain of parenting literature that assures me that I don’t have to. It says don’t interfere with your kid’s play, even if it includes guns and shooting and killing. Imagination is imagination and the violence isn’t real. It might even, so this line of thinking goes, be a healthy way for them to process feelings of aggression. We know where that problem ends, but it starts somewhere, too. One place to begin to look, at least, is at how our kids—particularly our boys—play, and how they are nurtured (or not), and taught to express their emotions (or not). It is, at least in part, up to us, their parents, to decide whether they are going to be the ones who help repair our society and reorient us (or not). And it begins with the kinds of care and love they receive, the kinds of conversations they are invited into, the kinds of expectations they are given about behavior and relationships. I want so much more for, and from, my little boy than “Pow, pow, yous are dead now!” And that starts with taking the gun or the stick or the rainbow flag out of his hands, sitting him down, and having a hard conversation about what guns actually do to people—and how much killing hurts us all.